Kevin Wallace is an independent curator and writer, focusing on contemporary art in craft media. He is a member of the Board of Directors of Collectors of Wood Art and on the Advisory Board of the Handweavers Guild of America. He is a contributing editor for "American Woodturner" and "Shuttle, Spindle & Dyepot" and a regular contributor to "Craft Arts International" (Australia) and "Woodturning" magazine (England), writing about contemporary art in craft media (wood, ceramic, and fiber) and wood artists. Wallace is the author of seven previous books. - Terry Martin is a wood artist, curator, and commentator on wood art. During the last twenty years, he has taken part in 80 exhibitions in seven countries and his work is part of many of the large private and public collections devoted to wood art. 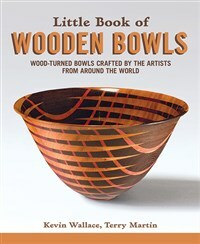 Martin is the author of "Wood Dreaming," published in 1995, the only book ever produced on Australian woodturning. From 1999 to 2006, Martin was editor-in-chief of the woodturning journal "Turning Points," the only journal dedicated solely to wood art, and is currently a contributing editor to "Woodwork" magazine. Martin has written more than 200 articles on wood art published in twelve journals in seven countries.